Printed from http://www.bodytalksystem.com//learn/news/article.cfm?id=839 on Apr 18, 2019. BodyTalk is a young modality, less than twenty years old, and although there are many practitioners around the world, it is still relatively unknown to the general public. It is so unlike anything that is currently offered that as a new practitioner, I struggle with how to concisely describe it to people in a way that will resonate with the western mindset, as there is nothing to compare it to. At first it appears relatively complex but at the same time, unforgivingly simple. I remember my first session as a client and trying to hold back a smirk as the practitioner tapped away on my head. When I woke up the next morning with my chronic throat congestion issue completely eradicated, the joke was clearly on me. Once you start to look at the vast array of systems operating in the bodymind, it makes sense how improving communication between all of these systems can improve and help maintain a state of health. The greatest gift of this modality is that you don't have to understand precisely the workings of every cell and energy system in order to utilize it as a practitioner or benefit from it as a client -- it's extremely accessible. BodyTalk practitioners around the world come from diverse backgrounds; some are doctors, chiropractors and nurses and others, such as myself, come from a field completely unrelated to healthcare. I became a practitioner because the healing I experienced as a client was unparalleled to what I had received elsewhere. More so, the sessions gave me insight into how our physical, mental, emotional and spiritual bodies are intertwined. This knowing prompted me to become more responsible for my health on all levels. 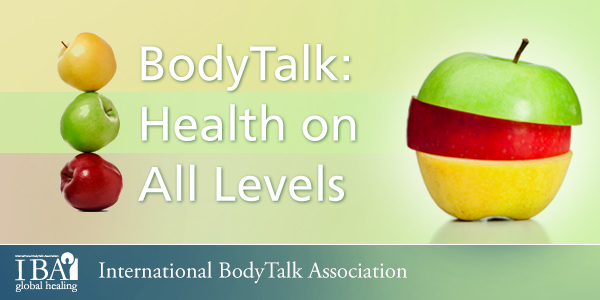 By addressing all levels of a person, BodyTalk uncovers what's happening beyond the physical symptoms to get to the root of problems. The computer can be seen as a metaphor for how our brain and heart function. Our brain, like the processor of a computer, processes information, and our heart, like a hard drive, stores the information. This is why tapping, to involve the heart and brain, is so crucial. During a session, as breakdowns in communication are highlighted and brought into awareness, tapping on the brain and heart ensure the changes are made and stored. Every bodymind is different and every client receives the session they need at that exact moment in time. Results can happen quickly or slowly and changes don't always unfold as we expect. The intelligence of our bodymind is greater than the perceptions held in the conscious mind. Being open to the fact that we don't need to know or understand how the imbalances correct themselves is key to embracing this modality. The bodymind will highlight for our conscious mind exactly what's needed, and when it's needed, in order for a shift to occur. An important thing to note is that BodyTalk works with the individual. For example, three people may have the same physical symptom for three very different reasons and so their sessions will be unique. In this sense, I find this modality very honorable. As a practitioner, I have noticed that many first sessions deal with general balancing; balancing breathing, the brain, etc. -- in metaphoric terms, I see this as washing the onion before we can begin to peel away the layers. In a world where people have been conditioned to expect immediate results, this sometimes slower process of unmasking and achieving bodymind health can be difficult to grasp, especially when challenged with new and unexpected concepts as to what constitutes good health. In western society, we are used to telling the body what to do. The ability to listen to the bodymind is something that has to be re-learned. There is definitely a learning curve involved with learning how to embrace the mindset of, "my body knows what it needs -- I need to listen to it," rather than, "I know what's best for my body -- it needs to listen to me." It's important to try to be open to the idea that what our ego thinks needs to be fixed is often just a symptom of a deeper imbalance. For example, aspects of our physical body may have lost touch with each other or stopped functioning properly due to belief systems held in the mind. The more I learn, the more I appreciate how our health is multi-faceted and multi-layered. In fact, I think the complexities of our being are beyond comprehension and the things we think we know about ourselves are just the tip of the iceberg. Personally, admitting a level of ignorance has opened the door to far greater knowing. Since we are constantly growing and evolving, mind, body and soul, as well as consistently dealing with a bombardment of external factors, caring for our health is a life long task. BodyTalk sessions are in keeping with those who desire non-invasive and gentle healing. Personally, the modality has helped me become more conscious of my emotions as I've repeatedly seen how stress and other detrimental ways of thinking can negatively affect the physical body. In this sense, I've been empowered when it comes to my health rather than feeling completely dependent on others. Taking care of myself with BodyTalk is just one aspect of my personal self-care regimen and now I'm thrilled to be one of many bringing it to others.